Yarn Type A luxury machine washable blend of merino wool and silk that has a wonderful soft handle, perfect for your little treasures. 66% Merino Superwash Wool, 34% Tussah Silk. A collection of 11 simple baby knitted garments perfect for any new addition to the family. Using a contemporary neutral colour pallet that gives a unisex appeal to the designs. Clean simple garments with hints of fun, include baby Blanket, Hats, Joggers, Sweaters, Cardigans and a Sleeping Bag. 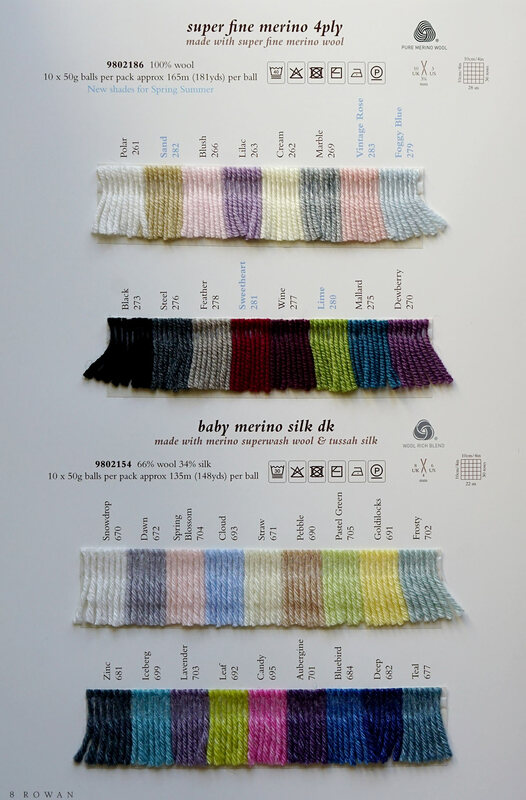 9 Designs for Children aged 2-7 years using Baby Merino Silk DK. Designed by Lisa Richardson & Sarah Hatton. A collection of 18 baby and toddler designs by Lisa Richardson featuring classic sweaters and cardigans which have been given a slight twist with the addition of button detailing and fully fashioned shaping. There are also fun dungarees and romper suits in strong colour blocked patterning. All designs are knitted using Rowan Baby Merino Silk DK. Knit these fabulous, funky toy chicks, a free pattern download originally from the Organic Cotton kids Collection. Designed by Janice Anderson, re-worked in bright shades of Baby Merino Silk DK (wool and silk) and re-named. This design is knitted mostly in stocking stitch, a perfect Easter knit gift for little ones. This knitting pattern is for the intermediate knitter. Knit this snuggly cardigan, a design from the Rowan archive originally featured in Classic Babies. Designed by Martin Storey using Baby Merino Silk DK, a luxury machine washable yarn designed specifically for babies (merino superwash wool and tussah silk), this design has basket detail pockets and flower motifs along the collar. Knit this round neck, button up cardigan, a design from the Rowan archive originally featured in Classic Babies. Designed by Martin Storey using Baby Merino Silk DK, a luxury machine washable yarn designed specifically for babies (merino superwash wool and tussah silk), this cardi has a cute scottie dog motif. Knit this accessory beret, a design from the Rowan archive originally featured in Classic Babies. Designed by Martin Storey using Baby Merino Silk DK, a luxury machine washable yarn designed specifically for babies (merino superwash wool and tussah silk), this pull-on beret has a cute scottie dog motif. Knit this childrens blanket, a design from the Rowan archive originally featured in Classic Babies. Designed by Martin Storey using Baby Merino Silk DK, a luxury machine washable yarn designed specifically for babies (merino superwash wool and tussah silk) this comforting blanket is knitted in squares of garter stitch and is perfect for bedtime cuddles. Once upon a time there was a bear family! Knit Daddy bear, Mummy bear and Baby bear designed by Martin Storey, a design from the Rowan archive originally featured in Classic Babies, this free pattern is now available to download. Using our gorgeous yarn Baby Merino Silk DK (merino superwash wool and tussah silk) this sweet family of bears are knitted in garter stitch and can be made in the colour combination of your choice. Knit this bolero cardigan, a design from the Rowan archive originally featured in Classic Babies. Designed by Martin Storey using Baby Merino Silk DK, a luxury machine washable yarn designed specifically for babies (merino superwash wool and tussah silk), this cardi is decorated with crochet cherries and is perfect for keeping little girls warm. Knit this gorgeous baby cardigan, a design from the Rowan archive originally featured in Classic Babies. Designed by Martin Storey using Baby Merino Silk DK, a luxury machine washable yarn designed specifically for babies (merino superwash wool and tussah silk), this cosy cardigan is finished with a pretty corsage. Crochet these sweet baby bootees, a design from the Rowan archive originally featured in Classic Babies. Designed by Martin Storey using Baby Merino Silk DK, a luxury machine washable yarn designed specifically for babies (merino superwash wool and tussah silk), these irresistible bootees are fastened with one button and the colour can be varied for girls or boys. Knit this adorable baby cardigan, a design from the Rowan archive originally featured in Classic Babies. Designed by Martin Storey using Baby Merino Silk DK, a luxury machine washable yarn designed specifically for babies (merino superwash wool and tussah silk), this soft button up cardigan is adorned with fluffy chick motifs.